Well, this is awkward. 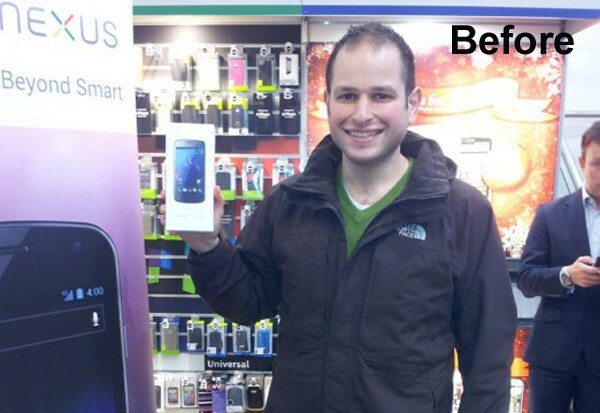 Samsung's PR team tweeted the above picture of Alex Ioannou as he officially became the first person to pick up a Galaxy Nexus in the UK. But Alex just got in touch to tell us that he's less than satisfied. We only have his word to go on at this point (and for all we know he could be secretly working for LG), but he insists he's having trouble syncing with Gmail because the usual account setup options are missing. Instead, his phone was apparently preloaded with a bunch of weird dev stuff -- including the handy option to "Report a WTF condition." We're desperately hoping that he was given a developer model by mistake and this will all be resolved when he exchanges. He's back in the store right now and says that apologetic reps are feeding him with ice cream sandwiches while he waits. Check out the 'After' photo and screenshots just beyond the break. First happy Galaxy Nexus customer isn't so happy, wants to exchange it originally appeared on Engadget on Thu, 17 Nov 2011 07:35:00 EDT. Please see our terms for use of feeds.